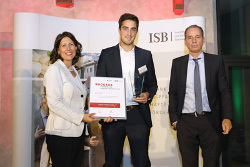 In October 2017 EVISCAN was honored as one of the winners of this years price competition Success 2017, announced by the “Investitions- und Strukturbank Rhineland-Palatinate”. Dominik Thoenes received the award in place of EVISCAN at the ceremonious award presentation. We are proud to get this prize as an acknowledgement from ecomomy and politics.